Certain varieties of aquatic floating weeds demonstrate an impressive ability to selectively absorb oil from contaminated water. These plants, which are often regarded as a nuisance, could in fact provide an extremely convenient way of cleaning up messy oil spills. Reporting their latest results in the journal Bioinspiration & Biomimetics, scientists in Germany based at Karlsruhe Institute of Technology's Institute of Microstructure Technology (IMT) together with researchers from the Nees Institute for Biodiversity of Plants at the University of Bonn, have been discovering what makes these plants so special. In their study, the team focused on a number of water plants including four species of Salvinia - an aquatic fern - which were selected for their hairy leaves. The shape of these hairy outgrowths, known as trichomes, falls into four categories and the researchers fine-tuned their sample to get the maximum information on the correlation between trichome type and oil absorption. "From our results we now know that the shape of the hair ends is important in supporting the oil/air interface to ensure maximum oil absorption and retention capabilities," said Claudia Zeiger of IMT. IMT has developed a synthetic version of these hairy surfaces dubbed 'nanofur', which is produced by pressing a hot rough plate into a polymer foil. "The surface of the polymer melts and, when the steel plate is retracted, micro- and nanoscaled hairs are pulled from the surface," explained Zeiger. 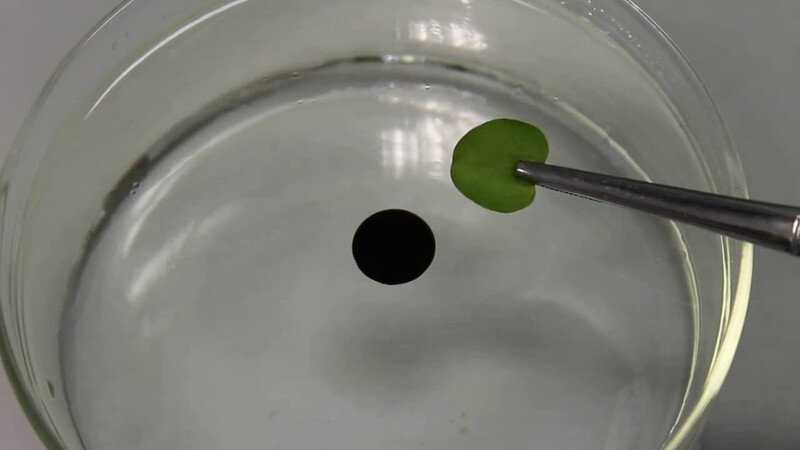 Nanofur is superhydrophobic and superoleophilic and, like the aquatic ferns, can selectively absorb oil while repelling water. One of the original goals of the current study was to learn from the plants to identify ways to increase the absorption capacity of nanofur, but the results also suggest other opportunities. As the researchers highlight in their paper, the species examined in the study are considered as weeds or pests in many regions of the world. Using these structures as oil absorbers might potentially solve two problems at the same time - the removal of unwanted plants and the production of natural and selective oil sorbent material at low-cost. A great follow-up would be to report on practical and real world applications of these promising processes.